COMPUTEX Taipei 2017, the international global event for the ICT set to take off on May 30, will feature a prominent eSports Area! As the sponsor of CyberMods 24hrs, KINGMAX will support PC modders from Australia, United States, United Kingdom, Thailand, Philippines, China and other countries to modify computers for video games, science fiction, and movies within a 24-hour deadline. Let KINGMAX light your fire for eSports through the brilliant solutions of these modders, who can be witnessed live as they work their magic. 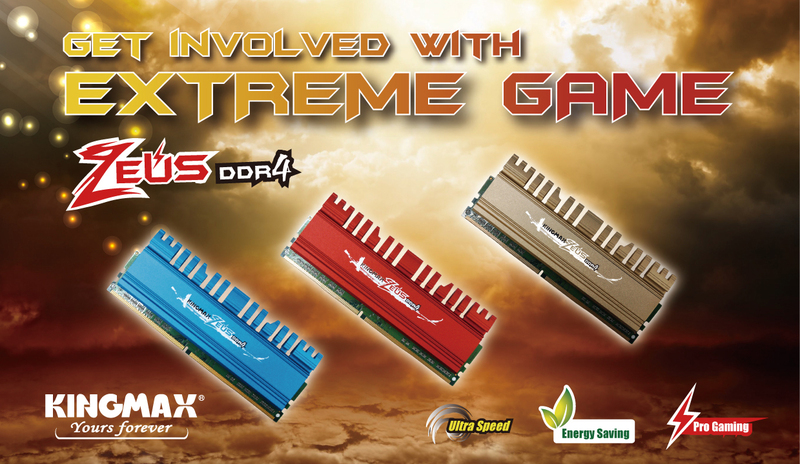 Aware of the stringent requirements of gamers, KINGMAX has comprehensively upgraded the performance of its memory lines, and is now launching its latest upgraded ZEUS DDR4 gaming memory, compatible with Intel Z270 chipsets, supporting Intel XMP 2.0 overclocking technology, with speeds of 3600MHz, a maximum capacity of 16GB, a voltage of 1.35V, and a CL value of 17. Specially designed for players in need of high performance, these new high specs for overclocking, high clock rate, and super stable low voltage design are sure to improve the performance and experience of any player! In addition, KINGMAX gaming memories for notebook computers boast with speeds of 3000MHz, a maximum capacity of 16GB, a voltage of 1.2V, and a CL value 16 that fully meet the needs of gamers on a wide range of devices! KINGMAX pursues the highest possible stability for each die on any given memory. Before shipping from the fab, each memory undergoes a rigorous test to ensure its future owner of the smoothest gaming experience! Soon, KINGMAX will launch a series of super-strong high-value gaming memory products to bring greater fun to all gamers around the world!